Randy Black, deputy chief with Durango Fire Protection District, goes door-to-door making sure everyone is evacuated in the Tamarron and Glacier Club area. The 416 Fire burned 1,100 acres Friday on the west side of U.S. Highway 550. Most of the homes are on the east side of the highway. 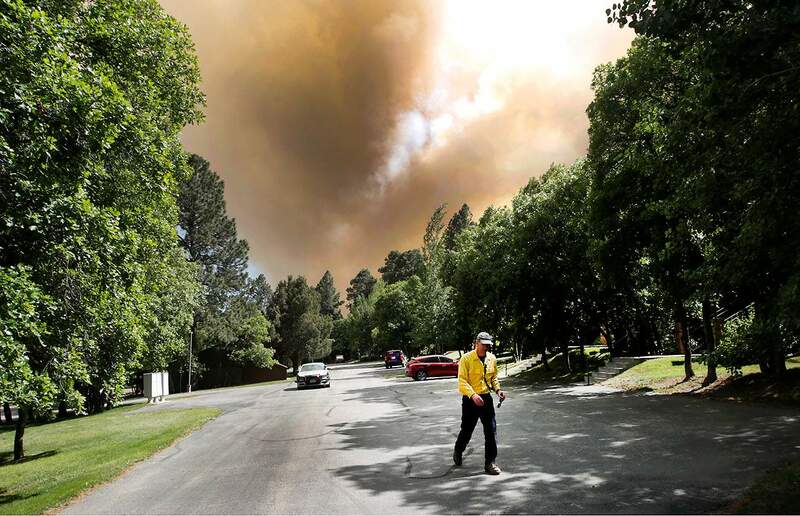 Randy Black, deputy chief with Durango Fire Protection District, goes door-to-door making sure everyone is evacuated in the Tamarron and Glacier Club area. About 825 homes were evacuated, and 760 were placed on pre-evacuation notice for a wildfire burning north of Hermosa. Volunteers evacuate donkeys from the Rockwood subdivision. About 825 homes were evacuated, and 760 were placed on pre-evacuation notice for a wildfire burning north of Hermosa. 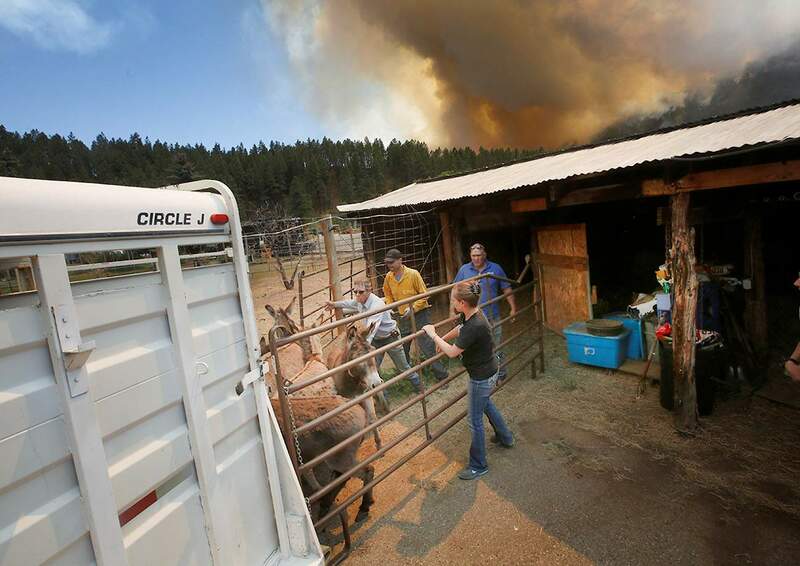 Volunteers evacuate donkeys from the Rockwood, which was one of several subdivisions being evacuated for the 416 Fire, which had burned 1,100 acres as of Friday night north of Hermosa. 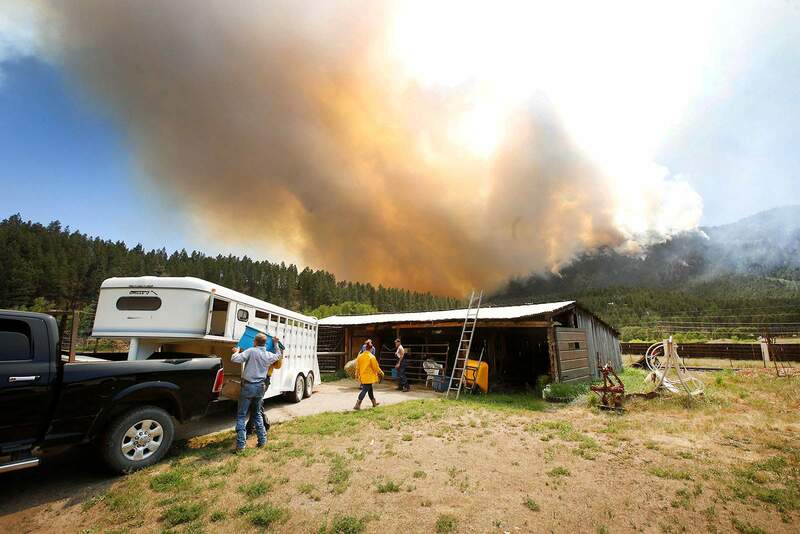 HERMOSA – Hundreds of residents were forced to pack their belongings and leave their homes for an unknown amount of time Friday in the face of a fast-moving wildfire burning 10 miles north of Durango. The 416 Fire burned more than 1,100 acres as of Friday night. About 825 homes were evacuated, but no homes had burned. Danch, a night nurse, said she saw smoke outside her window shortly after waking up around 10 a.m. She later received a call informing her that her home was under a pre-evacuation notice, and, a short time later, full evacuation. Residents were advised to grab their medications, clothing, animals, important documents, among other necessary items. 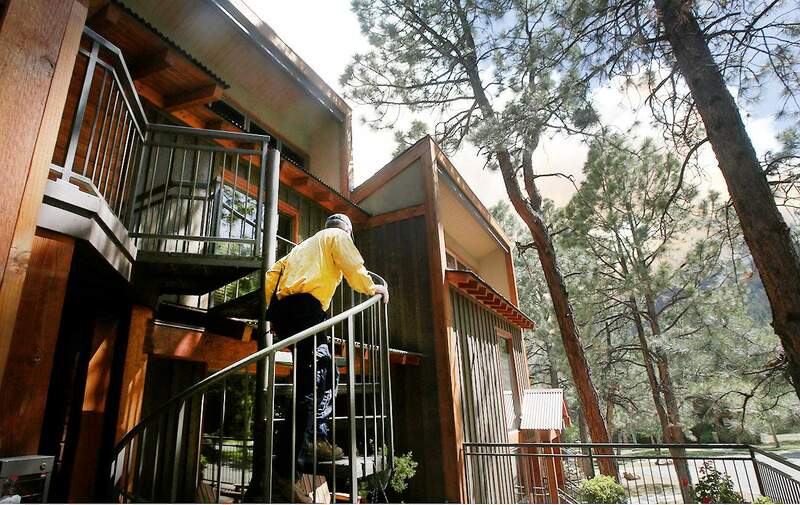 Much of Southwest Colorado is an “exceptional drought” – the most serious drought category – so many residents were aware of the potential danger this year for wildfire. Danch said she was prepared. She even had cat carriers ready for her animals. As is often the case during disaster situations, residents came together to help one another. Danch said her neighbor came to make sure she was awake and aware of the fire, because they know she works at night. Danch’s son, Keaton Cameron, was working on top of Electra Lake’s cliff when he saw the early stages of the fire. Cameron said he rushed down to touch base with his family. “When we found out we were actually getting evacuated, we just grabbed our pets and some family photos,” Cameron said. Cameron said he isn’t surprised by the wildfire, but he is surprised that it struck this early during the year. Several cars lined up at a roadblock on U.S. Highway 550 and County Road 250 to wait out the fire. Many hoped for a chance to grab personal belongings from their homes before being evacuated. James Johnson was en route to The Lodge at Tamarron, where his daughter was scheduled to be married Saturday morning. But he was stopped at a roadbock and prohibited from going to the lodge. The groom, Matt Spanjers, made it to the resort, but his fiancée, Vanessa Johnson, was stuck in Durango and began scrambling to find a backup plan. They have 350 out-of-town guests coming for the wedding, James Johnson said. Johnson was relieved when Elks Lodge in Durango came to the rescue and agreed to host the wedding on Saturday. Gretchen Bode, who lives in Electra Lakes Estates, was stopped at a roadblock and felt stressed out that she couldn’t get back to her home, which was on pre-evacuation notice. She wanted to help her husband, mother-in-law and 8-month-old child pack belongings for the evacuation. Gretchen Spitler, another Rockwood resident, was home when she saw the fire start. Spitler said she and her family, like Danch and Cameron, were prepared. “We have put a plan in place, our cars have been loaded,” Spitler said. “They said evacuate, and we were ready to go. An earlier version of this story misspelled Matt Spanjers’ last name.